Jacksonville passes Human Rights Ordinance protecting LGBTQ rights | Fight Back! Hundreds gathered at Hemming Park directly outside City Hall on Valentine’s Day, Feb. 14, awaiting news of whether Jacksonville's city council would pass an expanded Human Rights Ordinance (HRO) protecting LGBTQ community members from discrimination. Speakers, musicians, and DJs led the crowd in chants, songs and speeches as the city council debated inside on amendments to the bill. Councilman Bill Gulliford, the most prominent opponent of the bill, proposed to take the bill to a referendum of voters in hopes that local, statewide, and national anti-LGBTQ organizations could pour money into Jacksonville to defeat it. This amendment, along with many others, was soundly defeated in a quick vote. Around 6:45 p.m., attendees grew silent as the final vote came in. 12 for and 6 against. The crowd erupted into a deafening cheer as supporters inside and outside celebrated a victory many years in the making. Jacksonville is one of the last major cities in the U.S. to pass laws explicitly banning discrimination based on sexual orientation and gender identity. Because there is no federal law containing these protections, many states and cities have passed laws of their own, including all other major cities in Florida. Jacksonville's latecoming is not due to a lack of struggle for these rights. After years of relentless work, an HRO bill was presented to the city council in 2012 and voted down 10 to 9. A subsequent bill was proposed in 2016, but was withdrawn when it became clear the votes were not there. Rather, Jacksonville's city council approved this bill so much later than other cities because of the resistance of an especially reactionary section of local ruling elites opposed to any changes in the “good 'ole boy” system. This is the same local ruling class that posed such a threat during the civil rights era that it was deemed too dangerous for Dr. Martin Luther King Jr. to enter the city. This group manifests itself in large public establishments like the massive First Baptist Church, but is primarily made up of old wealthy Jacksonville families and large landowners. Despite this resistance, local organizations struggling for an expanded HRO, most prominently the Jacksonville Coalition for Equality, were able to force the city council to pass the measure on 2-1 margin. While supporters built community support, opponents of the bill attempted to make a farce of the proceedings. The city of Jacksonville hosted several public panels on whether to expand the HRO and local opponents insisted that a certain pastor named Kenneth Atkins sit on the final panel as a prominent religious opponent to the bill. Atkins' most infamous act was tweeting two days after the massacre at a gay nightclub, Pulse, in nearby Orlando by a heavily armed bigot that “been through so much with these Jacksonville homosexuals that I don’t see none of them as victims. I see them as getting what they deserve! !” Atkins had long been one of the most public figures opposed to the bill and consistently trotted out the familiar false right-wing talking point of LGBTQ rights being a gateway for child molestation in bathrooms. In a tragic irony, Atkins was himself subsequently arrested on Aug. 26, 2016 on charges of child molestation. The HRO that passed in Jacksonville contains protections in the fields of housing, employment, and services for the LGBTQ community, but some provisions were added to water down the effectiveness of the measure. First, there is still a large religious exemption that allows not only churches, but also religiously affiliated organizations to continue to legally discriminate on this basis. Additionally, the penalty for violating the measure was reduced from possible jail time and a fine to only a fine. Finally, small businesses are still exempt from portions of the bill. 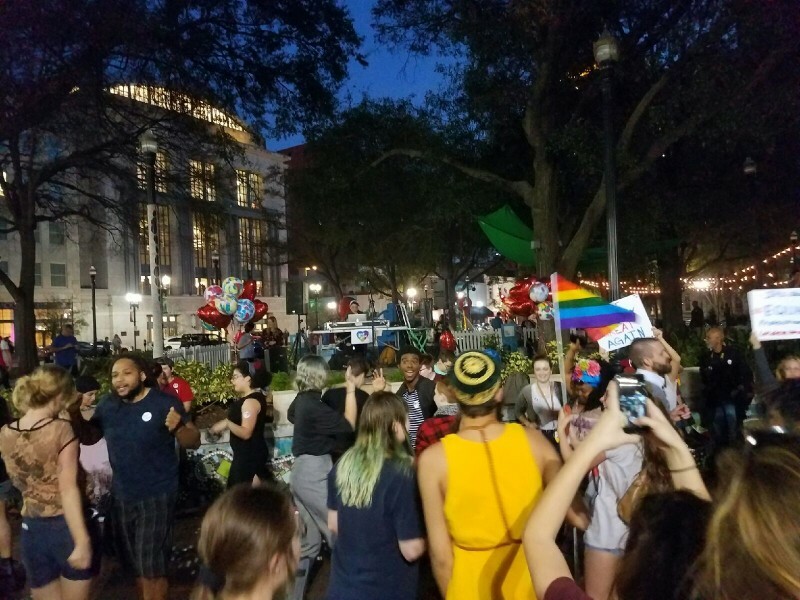 Many in the Jacksonville movement for LGBTQ rights vowed to continue fighting to fix these problems with the bill and also to resist any measures taken by the state legislature to overturn what they've accomplished so far. Republican state representative Randy Fine has proposed House Bill 17 which could overturn certain city regulations on businesses that have not been approved by the state. The law would take effect July 1 if passed. 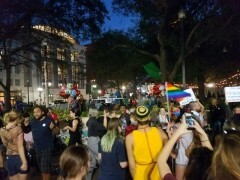 As the celebratory dance party in Hemming Park picked up after the news of the victory, long-time organizers took solace that their years of struggle had forced the reactionary city council, kicking and screaming, to finally pass the expanded HRO.